Dr. Oquendo is Professor and Chairman of Psychiatry at University of Pennsylvania. She attended College of Physicians and Surgeons, Columbia University and completed residency at Payne Whitney Clinic, New York Hospital Cornell. Until 2016, she was Professor of Psychiatry and Vice Chairman for Education at Columbia. In 2017, she was elected to the National Academy of Medicine, one of the highest honors in medicine. Dr. Oquendo has used Positron Emission Tomography and Magnetic Resonance Imaging to map brain abnormalities in mood disorders and suicidal behavior. Her expertise ranges from psychopharmacology to Global Mental Health. She has over 350 peer-reviewed publications. 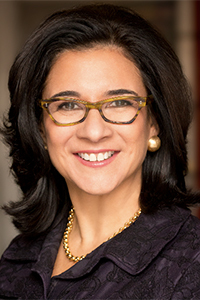 Dr. Oquendo is Past President of the American Psychiatric Association (APA) and the International Academy of Suicide Research, Vice President of the American Foundation for Suicide Prevention’s Board of Directors and has served on the National Institute of Mental Health’s Advisory Council. She is a Fellow of the American College of Neuropsychopharmacology, the APA and the American College of Psychiatrists (ACP). She has received multiple awards in the US, Europe and South America. Most recently, she was honored with the Virginia Kneeland Award for Distinguished Women in Medicine (Columbia University 2016), the Award for Mood Disorders Research (ACP 2017), the Alexandra Symmonds Award (APA 2017) and the APA’s Research Award (2018).